Himmeli requires two input files to work. The first, referred to as the configuration file, contains the instructions that specify where to look for the graph data and how to visualize it. Furthermore, the name of the configuration file is the only command line argument that Himmeli accepts, everything else is defined by the instructions. If you call Himmeli without any command line arguments, a concise listing of all features is printed on the screen.The second file, referred to as the edge file, contains the edges of the graph in tabulated plain text format. The first non-empty line of the file must contain the headings of the variable columns and the subsequent lines specify the graph topology. For each edge, you have to list at least the names of the end points on a single line of text in order for the edge to be registered by Himmeli. Brief instructions on how to install the program on various platforms and operating systems can be found within the installation package. A graph is essentialy a set of relationships (edges or links or arcs, depending on context) between distinguishable entities (vertices or nodes). Consequently, the minimum dataset that can be visualized by Himmeli consists of pairs of vertices, denoted by the tail vertex (starting point) and the head vertex (end point). 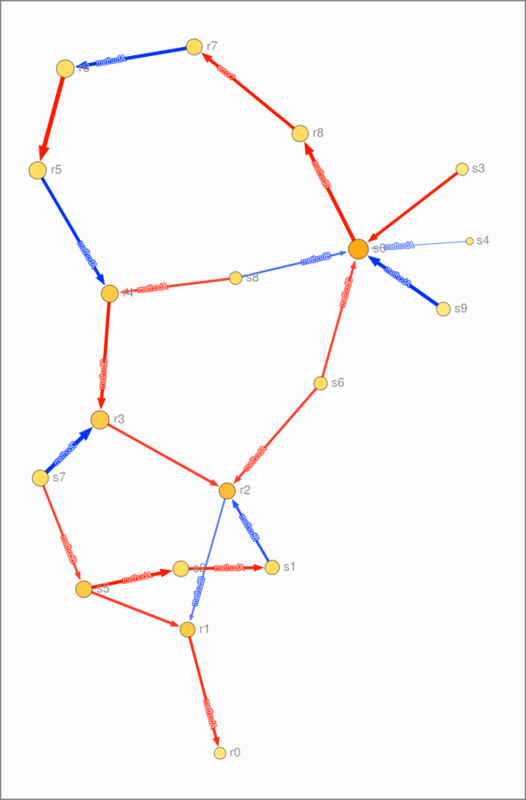 For now, it is assumed that the graph is undirected and no attention is paid to the order of vertices within a pair. You can also use full paths for GraphName and EdgeFile (e.g. ‘/home/johndoe/results/demoGraph’ and ‘/home/johndoe/himmelidemo/edges.txt’), which is useful if you want to store the results in another directory. Note, however, that Himmeli does not create new directories, so only existing paths can be used. Himmeli comes with ABSOLUTELY NO WARRANTY. under certain conditions; see the license file for details. Copied  997  bytes from 'edges.txt'. Wrote 8.44K bytes to 'demoGraph_0001.svg'. Wrote 3.33K bytes to 'demoGraph_0002.svg'. Wrote 3.31K bytes to 'demoGraph_0003.svg'. Wrote  985  bytes to 'demoGraph.config.txt'. Wrote 1.16K bytes to 'demoGraph.edges.txt'. Wrote 2.01K bytes to 'demoGraph.vertices.txt'. The screen output begins with version information and copyright statement for the various software modules within Himmeli. Next, a listing of the basic parameters is shown (there are also others, see the index). So far none of them is configured manually, so the default values are listed, but they will be modified in later sections of this document. After data imports, the detected variables are listed on the screen. There were only two data columns, hence only two are detected. The last entry in the listing indicates the number of the column: the head vertex data were correctly detected in the first column. Himmeli makes no assumptions about the topology of the graph. Before visualization, though, the graph must be broken into connected components for technical reasons. Here we have three components and the largest comprise 19 vertices and 22 edges. Next the vertex layout is calculated for each component separately. This is the computationally most demanding phase and can take a long time for large graphs. Finally, the drawings are saved in Scalable Vector Graphics (SVG) format, and the layouts are stored in plain text tables. The text files will be covered later in the section on repeatable layouts. The drawing for the largest component is shown in Figure 1. The weights can be any positive real numbers. Note that values close to or less than zeros will cause a rejection of the edge in question, and missing values or non-numerical entries are interpreted as zeros. The weight value range can be anything; Himmeli will normalize the weights automatically. If necessary, the normalization feature can be controlled manually, see the section on pruning and hiding edges for details. The edge weights affect the layout by pulling those vertices closer that have a strong link between them. To make the weights more apparent, the color and width of each line can be set to reflect the edge strength. By setting DecorationMode ‘on’, Himmeli will determine the graphical features automatically. If manual control is preferred, see the section on manual colors for further details. The automatic decorations also extend to the vertices: those vertices that have many adjacent edges (high degree) are drawn with bigger symbols, and the color is determined by the sum of the weights of the adjacent edges. The results are depicted in Figure 2. So far the direction of an edge had no significance on the way it was depicted. However, many real world networks contain information on directed associations. A gene transcription and expression network is one example: a transcription factor triggers gene expression, which in turn triggers new genes and so on. As mentioned earlier, the directionality is encoded in the head and tail vertex lists. A transcription factor for a gene would thus be encoded as the tail, and the target gene as the head, within a vertex pair. The direction does not affect the vertex layout (except the distance unit) but it changes the way edges are drawn. To show arrows instead of lines, ArrowMode should be activated. Color and width are effective means to convey the edge weight information, but sometimes it is useful to have labels on the edges for extra guidance. Labeling in Himmeli is controlled via LabelMode: by default it is set to ‘vertex’, which makes Himmeli to print the names of vertices. To show also edge weights, it can be fully activated (set it to ‘on’). The automatic labels can be replaced by user-defined text if necessary (EdgeLabelVariable and VertexLabelVariable). Adding arrowheads and labels to the graph requires more space to prevent undesired overlap of element. Therefore Himmeli adjusts DistanceUnit automatically to meet the needs. Of course, you can override this in the configuration file, if necessary. The directed drawing is shown in Figure 3. While it is convenient to have all the colors and other visual attributes automatically selected, in some cases you may need to set the colors based on other criteria than just edge weights. Himmeli makes this possible via two dedicated instructions EdgeColorVariable and EdgeWidthVariable. The human eye has three types of color-sensitive receptors, for red, green and blue. Consequently, colors are usually represented as a combination of the three main components according to the suitably named RGB scheme. In most web pages the color codes are hexadecimal numbers (such as A0F542) that indicate the red intensity in the first two digits, green in the next two and blue in the last two digits. Himmeli follows the same convention, except that the numbers are decimal to make the codes easier to use. Some examples are illustrated in Figure 4. If some of the color data is missing or invalid, the corresponding edges will be painted with a default color. If you wish to hide a specific edge, set the width to non-positive via EdgeWidthVariable (see also the section on pruning and hiding). 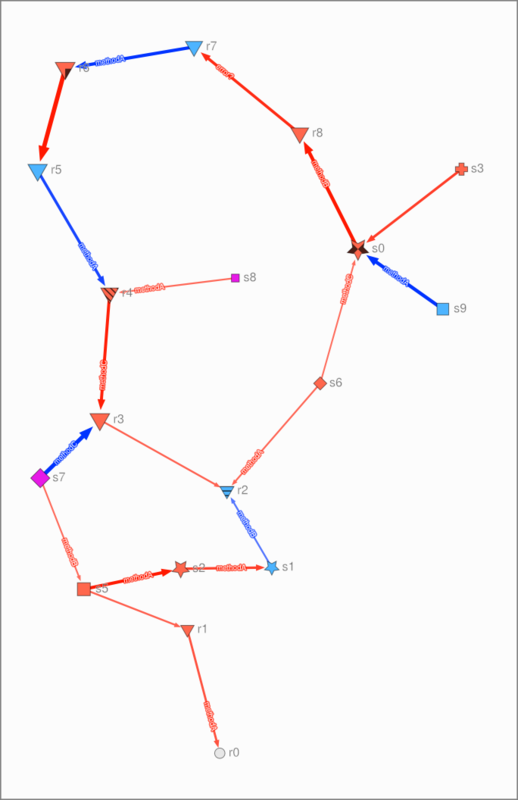 The results for the manually colored graph are shown in Figure 5. Those vertices that have only positive (red) arrows to other vertices are colored red (R=99, G=40, B=30), those with only negative arrows pointing to other vertices are colored blue (R=30, G=70, B=99), those with both are painted magenta (R=90, G=10, B=90), and finally the one vertex with no outward connections is painted light-grey. Note the new instructions in the configuration file: VertexFile tells where to look for vertex data, VertexNameVariable is needed to find the data records of individual vertices, and the VertexColorVariable denotes the column with color data. Although both the edge and vertex files have a column named ‘COLOR’, there is no ambiguity since the columns are located in different files. Of course they do not have to be the same in general, as long as the configuration file and data files are consistent. 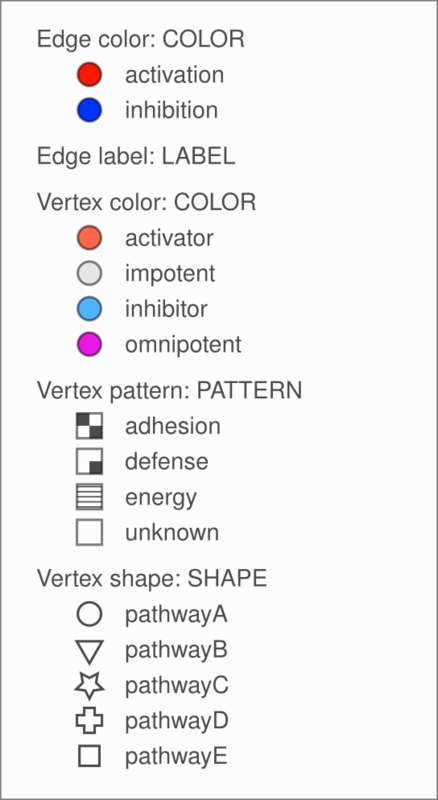 In addition to color, the configuration file contains instructions that control vertex shapes (VertexShapeVariable) and filling patterns within the symbols (VertexPatternVariable). The shapes and patterns are denoted by text keys and an optional rotation angle in degrees. For instance, to draw a diamond shape you start with a square and then rotate it 45 degrees to produce the final code string ‘square/45’. The fill patterns behave the same way as the shapes. For example, to create diagonal stripes, you start with the default horizontal stripes and then rotate by 45 degrees to produce the code string ‘stripe/45’. Additional examples of vertex colors, shapes and patterns are shown in Figures 4 and 6. For complex networks (in the topology sense) two-dimensional layout is always non-optimal and often somewhat difficult to grasp. One way to make the visualization clearer is to reduce the number of elements depicted in the figure according to pre-defined criteria. As a first step, a maximum spanning tree can provide insight into the topology, even if it discards most of the edges. Himmeli does the tree layout automatically if ChassisMode is activated. In fact, you can set the connectivity via an additional parameter, see the index entry on ChassisMode at the end of the document. Another way to reduce the number of edges is to remove those with small (or large) weights. Himmeli has a built-in filter feature (EdgeWeightFilter) which makes it possible to exclude certain edges without manipulating the edge file. The filter has two operating modes: if set to ‘abs’ all edges with a weight below the lower or above the higher limit will be removed from the graph prior to any analyses. If set to ‘frac’, the limits denote weight quantiles; to remove the smallest 10% you can use the instruction EdgeWeightFilter frac 0.1 1.0 in the configuration file. The results are depicted in Figure 7. 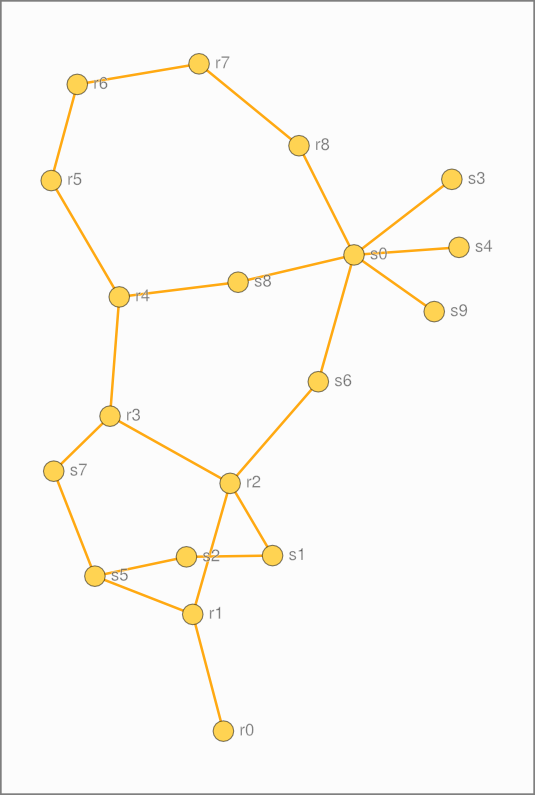 The largest connected component is now smaller (18 vertices and 19 edges) since some of the vertices became unconnected due to the removal of the affected edges. Often the preferred approach is to include all the edges when computing the layout, but leave out some from the final figure. This can be accomplished with EdgeWeightMask which works the same way as the edge filter except that the unwanted edges are removed only from the figures but are included everywhere else. In fact, the effect of the weight mask is equivalent to setting the width of the affected edges to zero. Note also that a filter and a mask can be applied simultaneously, if necessary. If you have already tried Himmeli repeatedly, you may have noticed that the vertex layouts differ between each run of the program. This is due to the adaptive nature of the layout algorithm: it adjusts the internal parameters continuously according to the available calendar time (set by TimeLimit) and since the operating system allocates an unpredictable amount of processing resources for Himmeli, the resulting layouts are, in general, indeterministic. To overcome this unwanted “feature”, Himmeli offers additional text files that simplify the reproduction of previously calculated layouts. The three files (new configuration, edge and vertex files) contain all the information about the graph, so you can store them instead of the figure files as a backup of the layout. Specifically, the layout coordinates are stored in the columns indicated by VertexXVariable and VertexYVariables. The new configuration file contains the instructions from the oiginal file, but also additional commands that override some of the original settings. Also, the new edge and vertex files are accessed instead of the original data files. To reconstruct the figures, simply use the command himmeli demoGraph.config.txt and the SVG files will be recreated. Obviously the names of the text files depend on the graph name; here it was set to ‘demoGraph’ in the original configuration file. The drawings will be identical to the originals, but there may be some small differences in the element information figure (demoGraph.info.svg) and edge and vertex files (demograph.edges.txt and demograph.vertices.txt). In particular, the edge weights were already normalized when stored, so the original values are lost. If the edges and vertices are visualized according to a pre-defined scheme, it is concenient to have the symbol information available in the figure. In earlier versions of Himmeli the software put the user-supplied items automatically in the figure files. After the migration to SVG, the users themselves can do this much better with Inkscape, hence the automatic positioning is no longer supported. If set to ‘on’, each edge will be augmented with an arrowhead. The default is ‘off’. Canvas background color, defined according to the convention presented in the section on manual colors. If set to ‘on’, Himmeli will use only the maximum spanning multi-tree instead of the full graph. The proportional connectivity can be set with the second argument (1.0 creates the spanning tree, larger values add more edges). The default is ‘off’. 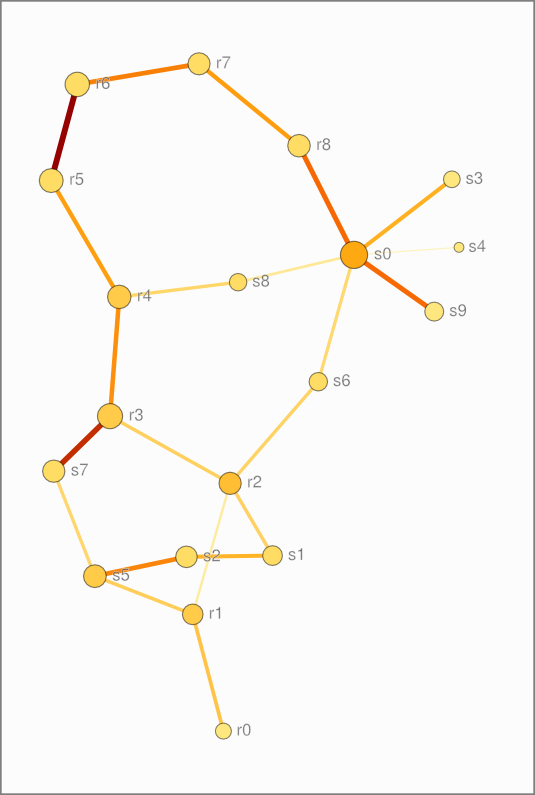 If set to ‘on’, Himmeli will decorate the graph based on edge weights and vertex strengths. The default is ‘off’. The character that separates the columns in the edge and vertex files. Use ‘tab’ for the horizontal tabulator and ‘ws’ for white space. The default is ‘tab’. The standard distance between nodes on the canvas. This is not a zoom; it scales the coordinate system that is used when drawing the figures in such a way that the node symbols are not modified, only their mutual distances are changed. The label (1st value) of specific a edge color (2nd value) in the info box. Colors are defined according to the convention presented in the section on manual colors. See also the section on information elements. Multiple info entries can be defined in the configuration file. The column of color definitions (1st value) in a data file (2nd value). Colors are determined by integer codes: use 000000 for black, 505050 for gray, 999999 for white, 990000 for red, 009900 for green, 000099 for blue, or any other between 000000 and 999999. See also the section on manual colors. Primary edge data file that contains the graph topology (pairs of head and tail vertices). The column of head vertices in the primary edge file (and in other files containing edge data). The column of edge labels (1st value) and the file where to look for them (2nd value). By default, the data file is the primary edge file. See also the section on labeled edges. The column of tail vertices in the primary edge file (and in other files containing edge data). To threshold edges by weight before node positioning, three values must be supplied: the type of filter (1st value), the lower limit (2nd value) and the upper limit (3rd value). There are two possible filters: ‘abs’ thresholds by absolute weight and ‘frac’ by quantiles. Edges not meeting the criteria will be ignored prior to any analyses or visualization. For instance, to include only the largest 10% edge weight fraction, type EdgeWeightFilter frac 0.9 1.0 in the configuration file. See also the section on pruning and hiding edges. Show/hide edges according to given thresholds. Works the same way as EdgeWeightMask except that the affected edges are filtered only with respect to visualization; all edges are included when computing the vertex layout and other graph characteristics. Transform edge weights to optimal range for node positioning. There are three types of transformations: use ‘lin’ for linear scaling, ‘log’ for logarithmic scaling, and ‘rank’ for rank-based normalization. By default, ‘auto’ is used (a combination of the three basic types). Set the feature to ‘off’ if raw weights are preferred. The column that contains numerical edge weights (1st value) in a data file (2nd value). Only positive values are accepted. If a weight variable is not supplied, each edge is given a uniform weight. The column of edge width multipliers (1st value) in a data file (2nd value). A non-positive width makes the affected edge invisible. Note that the widths in the drawing may be limited to a specific range due to technical reasons. The maximum allowed number of image output files. Cannot be more than 9999, default is 10. Base font size in standard units (default value is 0.4). This has no effect on the info box. Canvas foreground color (symbol outlines and text), defined according to the convention presented in the section on manual colors. Base name for output files. The template for component drawings (ranked by size) is [graphname]_[rank].svg, for other files [graphname]. [type].svg is used. If set to ‘on’, Himmeli will start the node-positioning algorithm from the layout that is supplied in the vertex file(s). The default is ‘off’. If set to ‘vertex’, the drawing is augmented with vertex names or user-defined labels. If set to ‘edge’, edge labels (or weights if no data available) are written on the edge lines. If set to ‘on’, both previous options apply. The default is ‘vertex’ (use ‘off’ to disable this feature). The time quota in seconds for computing the node positions. If set to zero, no simulation is performed. The default is 10. If set to ‘on’, Himmeli will print all runtime messages. The default is ‘on’ (use ‘off’ to disable the feature). The label (1st value) of a specific vertex color (2nd value) in the info box. Colors are defined according to the convention presented in the section on manual colors. See also the section on information elements. Multiple info entries can be defined in the configuration file. Primary vertex data file. You do not have to supply data for every vertex; only those vertices that are present both in the edge and vertex files will be recognized. The column in the vertex file that contains vertex names. Note that every file with vertex data should have a column with the same name to correctly identify vertices in each file. The column of vertex labels (1st value) and the file where to look for them (2nd value). By default, the data file is the primary vertex file. If no labels are available, vertex names are used instead. See also LabelMode. The label (1st value) of a specific vertex pattern (2nd value) in the info box. Patterns are defined according to the convention presented in the section on fill patterns. See also the section on information elements. Multiple info entries can be defined simultaneously in the configuration file. The column of pattern definitions (1st value) in a data file (2nd value). Six fill patterns are supported: use ‘cheque’ for a chequered pattern, ‘parallel’ for parallel stripes, ‘spot’ for a rectangular spot on one corner, ‘hole’ for a filled vertex except a corner rectangle, ‘half’ for a half-fill and ‘circle’ for a filled circle on one corner. In addition, the patterns can be rotated to allow more versatility. For instance, to create diagonal stripes, use the pattern code ‘stripe/45’ to rotate the otherwise horizontal lines 45 degrees. See also the section on fill patterns. The label (1st value) of a specific vertex shape (2nd value) in the info box. Shapes are defined according to the convention presented in the section on vertex shapes. See also the section on information elements. Multiple info entries can be defined simultaneously in the configuration file. The column of shape definitions (1st value) in a data file (2nd value). 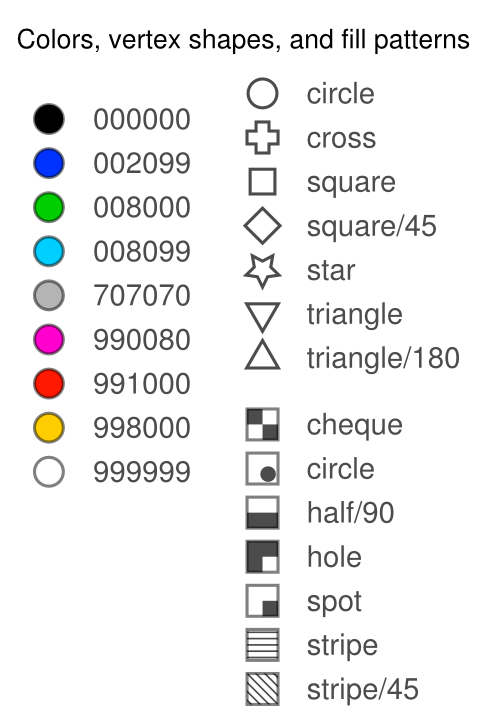 Five basic shapes are supported: ‘circle’, ‘triangle’, ‘cross’, ‘star’, and ‘square’. Furthermore, the shapes can be rotated to allow more versatility. For instance, to create a diamond shape, use the shape code ‘square/45’ to rotate a square 45 degrees. See also the section on vertex shapes. The column of vertex size multipliers (1st value) in a data file (2nd value). A non-positive size makes the affected vertex invisible. Note that the symbol sizes in the drawing may be limited to a specific range due to technical reasons. The column of horizontal positions (1st value) in a vertex data file (2nd value). The scale of the SVG elements is such that the mimimum distance between vertices should be 1 in the user-defined coordinate set. See also the section on repeatable layouts. The column of vertical positions (1st value) in a vertex data file (2nd value). The scale of the SVG elements is such that the mimimum distance between vertices should be 1 in the user-defined coordinate set. Note that in SVG the canvas is inverted vertically.